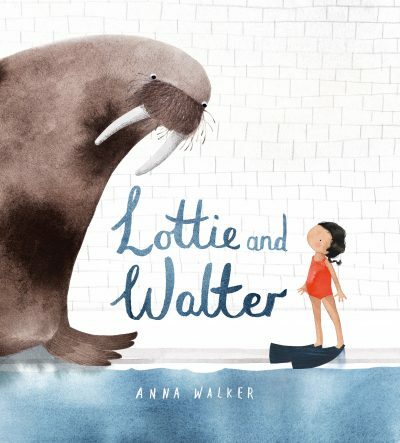 Following in the tradition of her previous works Mr Huff and Florence, Anna Walker once again pays tribute to the creativity and resilience of children in this tale of a little girl, a swimming pool and a singing walrus named Walter. Lottie, who is scared to get in the water, finds strength in endearing Walter and his lovely rumbling: ‘Humbelly Doo, Lumbelly La, Loopy Loo …’ The story is firmly told from Lottie’s perspective. For example, we’re never told that she is afraid of the pool, but simply that she knows a secret: there’s a shark in there and it only wants to eat her! Lottie’s mother hovers in the background throughout the book but she never directly interferes with Lottie’s emotional journey. This narrative decision imbues the work with gentle reassurance while still allowing Lottie to be an empowered character. Walker’s illustrations bubble with humour, charm and whimsy—readers will adore delightful details such as the bite mark on the floating donut in the pool, or the way the shadow of the shark in the pool elegantly changes into the shadow of a kind-hearted walrus. This is an entirely gorgeous and empathetic book for ages three and up.